“Stick” with labels from Ohio Identification Solutions for all of your labeling needs. From Thermal Transfer to Laser sheet labels Ohio Identification Solutions has a label solution for your application. Our label products are made with some of the highest quality pressure sensitive label materials available and manufactured by some of the world’s leading label convertors. We offer a variety of pressure sensitive labels at discounted prices for all brand name label printers. 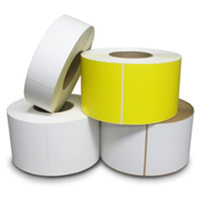 Thermal transfer labels are designed for use in thermal label printers and require the use of a thermal transfer ribbon. Direct Thermal Labels can be used in a wide range of label printers and do not require the use of a thermal ribbon. Our thermal transfer labels are available in both rolls and fan-folded packs. All label materials are available in popular label sizes and some as continuous pressure sensitive label material. In cases where a stock size is not available for your labeling requirement, we can provide custom special order blank labels, or produce pre-printed custom labels. We highly recommend that you test all thermal transfer labels and ribbons in the end use application prior to purchasing. Sample ribbons and thermal transfer labels are usually available at no charge upon request. Click here to request FREE samples of thermal transfer labels.